PLU: PLU stands for Price Look Up Code, but the easiest way to understand it is as a button on your till that adds corresponding items to an order. In order for any item to be added to a till it needs to have a PLU (EPoS Item) set up for it. Once added to a venue’s EPoS menu, a PLU appears as a button that adds an item to a customer’s bill. Any Ingredients and Products can be added to a PLU’s recipe, which allows Kobas to keep track of stock and usage of these items. However, a PLU can be set up for any item you wish to dial through the till, regardless of whether you have attached any Ingredients or Products or not. 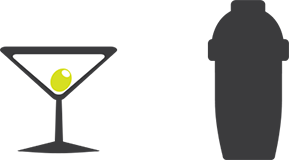 To view your PLUs, go to EPoS > Item (PLU) Manager in Kobas Cloud’s main menu. 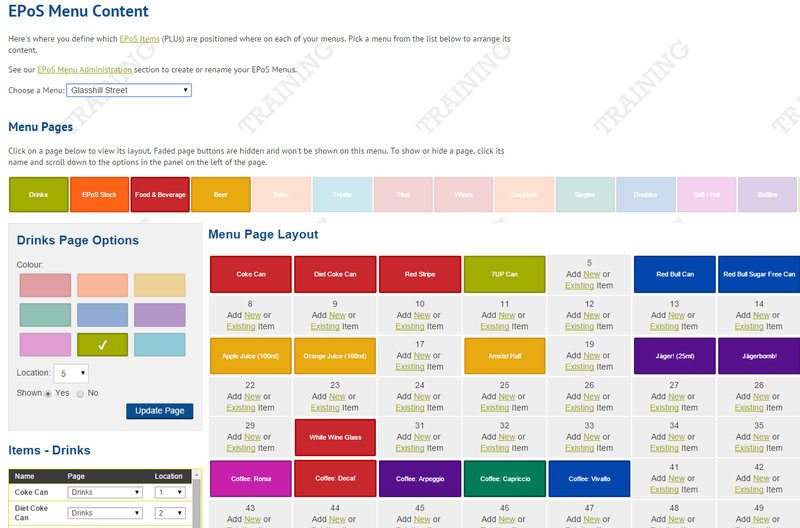 In this screen you will see a list of all the previous PLUs you have already set up and you can edit each as required. Under General you are able to specify the name of your PLU; what category the PLU falls under (eg. Eat-in food, beer, spirits ect); if a PLU has a specific barcode and what venues the PLU will be available in. You can add a picture of the PLU here if required. This section also calculates the cost price of your PLU. Retail Prices allows you to set prices for your PLU. You can set different prices for whether the item is ordered to eat in, takeaway or for delivery (if you offer those options). Kobas will calculate your net margin and gross profit % for the PLU based on what prices you set here. 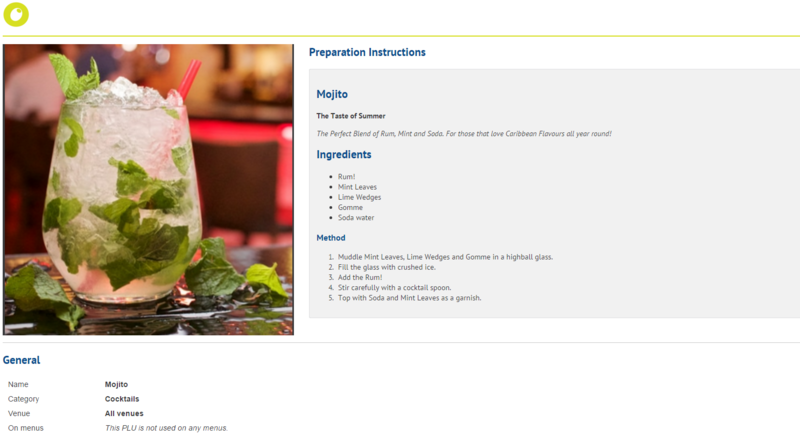 The Recipe tab allows you to specify which Ingredients and Products comprise the item you are selling. For example, if you were creating a button for a certain beer, that beer would be the only Ingredient you would add. However, if you were selling a Spaghetti Bolognese that comprised of tomato sauce, beef mince and spaghetti then you would add each component and specify the amount of each used in the final dish. That way, each time a customer ordered Spaghetti Bolognese, Kobas will figure out how much stock is used of each Ingredient and Product that comprised the dish. This is very useful for adjusting portion sizes and seeing how this affects your margins. This step is not compulsory if you do not require stock levels to be tracked. 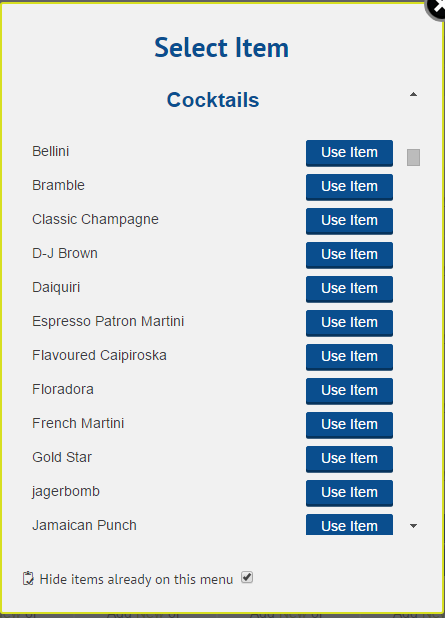 The Post Item Selection Configuration (PISC) tab allows options to be added to your item after it has been selected on the till (eg Cooking specifications, what mixer, if a customer wants an extra ingredient added to the item). For information on how to do this, please see An Introduction to Post Item Selection Configuration. This step is not compulsory, if no PISCs are required. The Item Preparation Printers tab allows you to specify if you need a work docket to be printed at a specific printer. If you have multiple PLUs on an order, then instructions for different items can be sent to different parts of the venue. For example, if your PLU is for Spaghetti Bolognese, this option would allow you to send a work docket to the kitchen staff, and the bar staff could be alerted to an accompanying glass of wine. This step is not compulsory if not required. The Preparation Instructions tab allows you to specify the preparation steps for the PLU. This can be used by staff as a reference for specific preparation instructions for the PLU. This step is not compulsory if not required. Once you have entered the details of the PLU then click Save Item. Your PLU should now appear when you go to EPoS > Item (PLU) Manager. 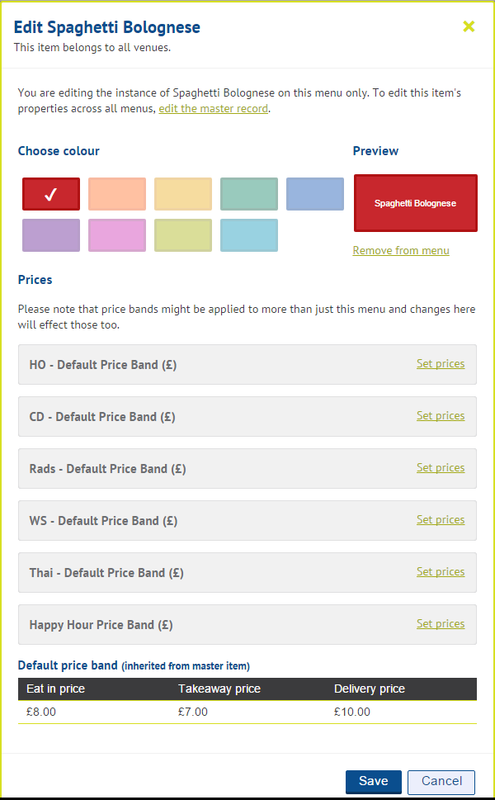 Once you have set up a PLU for an item, it is simple to add it to a venue’s EPoS menu. Beneath the heading Menu Pages, you will see the different menu pages available for you to add your PLU to. These will likely be titled by category, so select the one you want to add your PLU to. The Menu Page Layout allows you to select the location for a button to be added to the menu that will allow you to add your PLU to an order. You have the option of creating a new PLU or setting up an existing PLU to be added in each available square. Once you click to add an existing item in the square you want to use you will be presented with a Select Item box. This will show you all of the PLUs that are available to be added to this menu. You have the option to “Hide items already on this menu” if you don’t want to risk accidentally adding a double-up of a PLU that is already on the menu. Click Use Item on the item you require. This should now appear on the Menu Page Layout in the location you selected. Once you hit save, your PLU will be added to your chosen menu. To process any menu changes, remember to always “download data” on your EPoS. Once you have done this your PLU is ready for sale. For more information on Ingredients or Products please see Ingredients, Products and PLUs explained.